When you buy a Livestrong LSPro2 treadmill you get a free Passport media player, which shows interactive views of trails and cityscapes from around the world on your home TV. 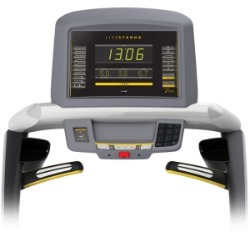 The large LED display shows all relevant workout stats including time, distance, calories/heart rate, speed, and incline, and the console has an LCD window that shows the Livetrack™ Fitness Journal information. 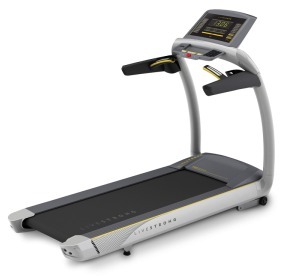 The pre-set programs of the Livestrong LSPro2 treadmill are: Manual, Peak Intervals, Speed Intervals, Weight Loss, Rolling Hills, Foot Hills, Mountain Climb, 5k, 10k, Pacer, THR Zone, HR Intervals, Austin, Spring Classic, and Custom. Unit Weight/Dimensions — 290 lbs; 79" x 35" x 59"
UPDATE: Johnson Health Tech has stopped making treadmills under the Livestrong name. Check out NordicTrack as well as their other brands, Horizon and Vision for comparable treadmills. The commercial-grade 3.25 hp continuous duty motor is the base of an ultra-quiet drive system on the Livestrong LS Pro2 treadmill. They added a new maintenance free belt and 60mm rollers so you don’t have to worry about lubricating the deck or realigning the tread belt. Other features include the integration of full cast aluminum components to eliminate vibration, and a new RunnerFirm™ cushioning system for a comfortable workout every day you use it. 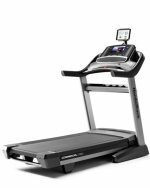 The rest of the features are what you would expect to find on a $1999 machine: a 20" x 60" running deck with belt speeds up to 12mph, 14% incline, contact heart rate monitoring, and a 400-lb max user weight capacity. The USB device and the Livetrack Interactive technology greatly expand the number of workout programs you can access. You simple use the flash drive to record and upload your workout stats from your onboard Livetrack Fitness Journal to a private account at livestrong.com. With it, you can also download free training programs designed by Lance Armstrong’s personal trainer, Peter Park. This new Livestrong LSPro2 treadmill is a strong contender at the $1,999 price level against some of the market’s best-selling treadmills from Sole, Precor, and others. Reviews by equipment pros and users have given it a thumbs-up for its powerful motor, advanced cushioning, quiet operation, good warranty, and all the great programming features, especially the exciting Passport player. This is a great machine for anyone who wants the pleasure of owning a good-looking, well-designed runner’s treadmill in their home.